Scottsdale’s cultural roots run deep, from the area’s first inhabitants, the Hohokam, to the cowboys, ranchers and farmers that followed in the late 1800s. 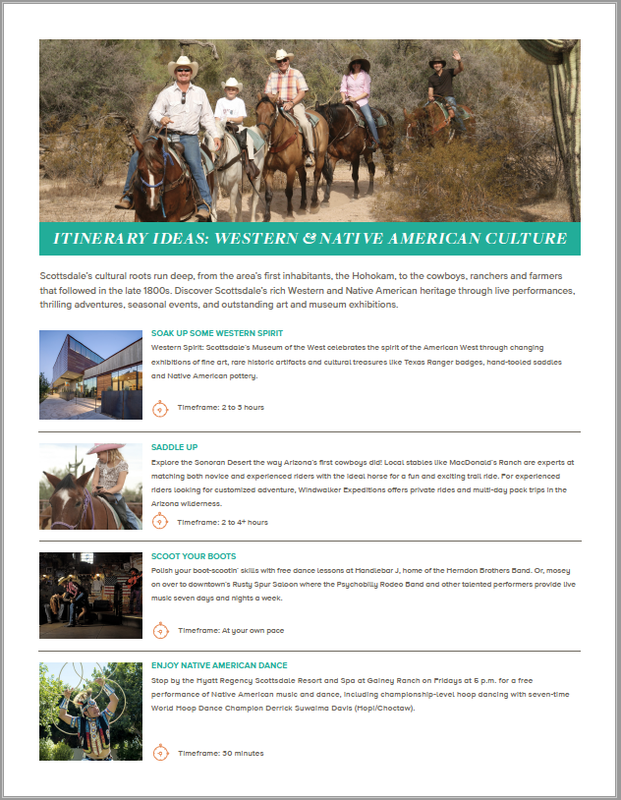 Discover Scottsdale’s rich Western and Native American heritage through live performances, thrilling adventures, seasonal events, and outstanding art and museum exhibitions. Western Spirit: Scottsdale’s Museum of the West celebrates the spirit of the American West through changing exhibitions of fine art, rare historic artifacts and cultural treasures like Texas Ranger badges, hand-tooled saddles and Native American pottery. Explore the Sonoran Desert the way Arizona’s first cowboys did! Local stables like MacDonald’s Ranch are experts at matching both novice and experienced riders with the ideal horse for a fun and exciting trail ride. For experienced riders looking for a customized adventure, Windwalker Expeditions offers private rides and multi-day pack trips in the Arizona wilderness. Polish your boot-scootin’ skills with free dance lessons at Handlebar J, home of the Herndon Brothers Band. Or, mosey on over to Old Town’s Rusty Spur Saloon where the Psychobilly Rodeo Band and other talented performers provide live music seven days and nights a week. Stop by the Hyatt Regency Scottsdale Resort and Spa at Gainey Ranch on Fridays at 5 p.m. for a free performance of Native American music and dance, including championship-level hoop dancing with seven-time World Hoop Dance Champion Derrick Suwaima Davis (Hopi/Choctaw). Saba’s Western Wear in Histortic Old Town Scottsdale has been outfitting cowboys and cowgirls for more than 80 years. Try on the latest Western fashions, including jeans, pearl-button shirts and chic cowboy boots. Gain insight into the culture and lifestyle of the ancient Hohokam at Pueblo Grande Museum & Archeological Park. Ruins of a Hohokam village and replicas of traditional houses are easily accessible along a 2/3-mile interpretive trail. Roaring Fork, you’ll enjoy wood-fire cooking that combines elegant flavors with a rugged, cowboy edge in specialties like the Cedar Plank Salmon, Braised Beef Short Ribs and Green Chili Mac & Cheese. At Bootleggers Modern American Smokehouse, craft barbecue and house-selected moonshine top the list of menu favorites (don’t miss the Bacon Board, featuring five types of bacon, you can thank us later!). And at Bryan’s Black Mountain Barbecue, carnivores will love the beef brisket and pulled pork, while vegetarians can savor a “pulled” squash sandwich topped with coleslaw or a fried egg. The Heard Museum is world renowned for its outstanding collection of Native American art and cultural artifacts from the tribes of the Southwest. The museum also hosts the annual World Hoop Dance Championship (February) and Heard Museum Guild Indian Fair & Market (March). For more information on these and other Scottsdale adventures, contact our destination experts at toursim@experiencescottsdale.com .